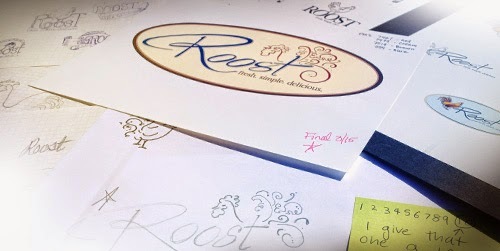 In a small, all-American, rural town on the central coast, lies a quaint little bistro called ROOST. When the proprietor came to me to design his logo, he told me that he wanted his restaurant to be the place where people come to sit and share their life with others – and of course share amazing food. Chef, Jim Griffin has a long history of opening restaurants, bringing them to financial success, and then selling them when he's ready for something different. He is a "foodie" if I have ever met one and his food is truly delicious. He sat in my office describing the food that was going to be on his menu and I got inspired, and hungry! You know a "foodie" by the way they think about and describe food — Jim is at the top of my list. During our conversation I made notes about the things that mattered the most to him and then got to work. The sketching process is still done by hand in our studio and the best of that process get further refined on the computer. We usually show the client at least three completed logos, which we feel are excellent options to represent their business or product. We presented six design ideas to this particular client. The final logo was hand-lettered (not an existing font) and illustrated. "For five decades, Graphic Design USA has sponsored competitions to spotlight areas of excellence and opportunity for creative professionals. GDUSA's American Graphic Design Awards™ is the original and the flagship, open to all in the community: design firms, ad agencies, corporations, non-profits, institutions, and more. It honors outstanding work of all kinds and across all media. For the ninth straight year, more than 8,000 entries were submitted; a very highly selective 15 percent are recognized today with a Certificate of Excellence. In the rare case of multiple awards, a Certificate for each winning piece is enclosed." Studio 101 West Marketing & Design actually received the "rare case of multiple awards." We received a total of three awards from GDUSA. The other two are for the logo design of the Central Coast Wedding Professionals (CCWP) and the branding program for the same organization, CCWP. (see CCWP blog post).